On my way back to Los Angeles from San Francisco last weekend, I stopped in Albany (near Berkeley) to have dim sum with Rica. Rica and Loren are similar because, when they enter a dim sum restaurant, they suddenly transform into ravenous food whores. And their M.O. is to order as much as possible, until the table is covered in steamed baskets and the wait staff is horrified by such a public display of unabashed gluttony. 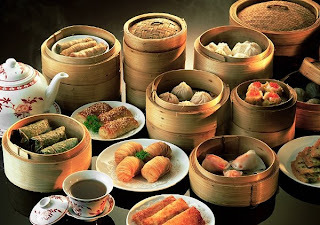 The last time I had dim sum with Rica, there was enough food on the table to feed a small Asian nation. This time, I took charge and set a limit on how much we could order. It's the proper and most Asian thing to do. Rica, I'm rescinding your race card.